Once ubiquitous in working-class communities, labor schools have succumbed to decline. Their history holds lessons for any future revival of working-class activism. 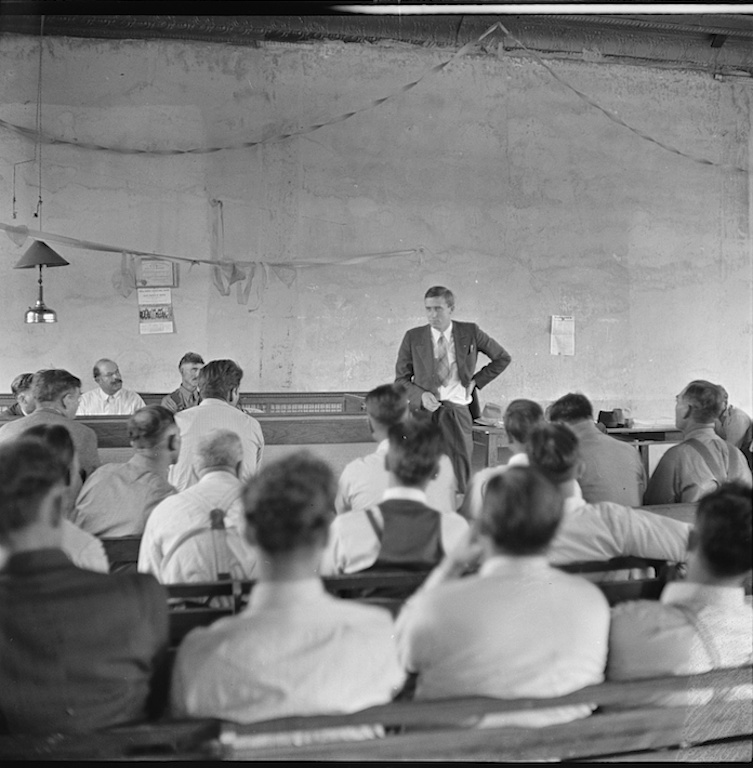 A 1938 union meeting of Colorado sugar beet workers. Farm Security Administration / Library of Congress. There was once a time when the Catholic Church was at the forefront of worker education in the United States, and when labor schools — which brought together workers from different industries to learn the basics of union organizing, parliamentary procedure, collective bargaining techniques, labor law and history, and public speaking — played instrumental roles in training everyday men and women to assert their power in the workplace. Labor education programs still exist in a few academic settings — at Cornell, at Penn State, and at the Boston Labor Guild, which the Archdiocese of Boston has administered for almost seventy years. But at many universities worker schools have come under attack in recent years from conservative think tanks, nonprofits, and politicians. Meanwhile, the decline of the community-based labor school movement coincides with the drastic reduction of union membership since that period. But in an era of increasingly non-democratic, arbitrary control of workers’ lives by employers, there is a corresponding need for organized labor educational programs like those that were once common in the heyday of union power — schools that will train working-class students in the fundamentals of labor law and organizing tactics, that will empower rank-and-file union members, and that will give them the opportunity to develop the sort of communities that are essential for revitalizing unions. The recent wave of teacher strikes may offer the sort of social movement blueprint required for successful labor education: as Ellen David Friedman argues, such movements are “bottom-up, scrappy, unfunded, rooted in a critical social analysis, and committed to radically democratic values.” A rebirth of grassroots labor schools, conscious of the challenges and failures of those preceding them in the postwar period, could have a powerful impact in training disenfranchised workers for successful campaigns to remake the balance of power in the public and private sectors. The history of Catholic labor schools provides an instructive example of the possibilities and pitfalls of worker education. By the 1920s, the National Catholic Welfare Council (NCWC) — now known as the United States Conference of Catholic Bishops — had been strongly influenced by the Church’s social teaching. Growing out of Pope Leo XIII’s 1891 encyclical Rerum Novarum, this body of doctrine regarded unions as an exercise of workers’ natural right of association. Though Pope Leo and the Church rejected socialism, they also recoiled from aspects of capitalism, preferring a middle course that envisioned cooperative workplace management shared by workers and employers. As the NCWC expanded its post-World War I reconstruction work, its efforts to promote Catholic social teaching gave rise to a generation of labor priests who saw it as their mission to take the Church’s social teaching, and the writings of Catholic social theorists like John A. Ryan, directly to Catholic workers. Priests like George G. Higgins, who served as director of the NCWC’s Social Action Department (SAD) for many years, spent decades organizing Catholic workers and providing assistance to parishes, dioceses, and colleges attempting to forge a spirit of solidarity with the Catholic working men and women they served. To reach Catholic workers, SAD made use of labor schools, administered by dioceses, Catholic colleges and seminaries, religious orders, and groups like the Association of Catholic Trade Unionists (ACTU). At its peak, the Catholic labor school movement counted over one hundred local schools, and its reach was amplified by SAD’s national publishing efforts. Labor priests and lay workers taught and learned from one another at regional social action conferences and then brought these lessons to workers in their local communities. The movement had scattered antecedents, such as New York priest Paul Dietz’s Militia of Christ for Social Services and, perhaps most notably, Dorothy Day and Peter Maurin’s Catholic Worker, which offered classes on labor relations and various other subjects in the early 1930s. But SAD’s efforts were significant because they unified disparate labor education efforts and built an effective national network. New York’s Xavier Institute of Industrial Relations (the real-life inspiration for Elia Kazan’s 1954 film, On the Waterfront), Hartford’s Diocesan Labor Institute (DLI), Detroit’s Archdiocesan Labor Institute and ACTU branch, and dozens of similar labor schools worked for decades to bring Catholic social teaching to workers and to instill in them the confidence necessary to organize and protect their rights on the job. Classes, which included lectures and guided seminar discussions, were offered to workers in the evenings and branched out into the local community. Hartford’s labor school chapters held essay contests for young students to explore Catholic social teaching, challenged racism in the state National Guard and in public housing, lobbied for a Fair Employment Practices Commission for Connecticut, and coordinated a statewide Social Action Sunday, during which almost 200,000 copies of social justice literature were distributed to Catholic laypeople. In the beginning, the demographics of labor schools represented cross-sections of local, Catholic, working-class communities. Non-Catholics were welcome to attend, but classes had a decidedly Catholic atmosphere. The spring 1953 cohort of the Xavier Institute of Industrial Relations in New York, which the school considered “quite typical” except for a “higher than average” number of non-union students, was overwhelmingly male, with the vast majority of students not attending college and the plurality not finishing high school. More than 60 percent were union members. Attendance was generally high in the 1940s and 1950s at many Catholic labor schools, but enthusiasm for the programs began waning in the years following organized labor’s most striking triumphs and the initial stirrings of the anti-union response from capitalists and conservative public officials. A marked shift of focus occurred in this period, with labor priests moving away from their previous strategy of educating as many workers as possible, narrowing the scope of their classroom activities by selecting for the chapters only those workers perceived to have leadership potential. This deviated from the original plan of the Catholic labor schools, which was that they would build solidarity among the rank and file of the working class. Philip A. Carey, the Xavier Institute’s director, described his “ideal student” as “a truck driver or a longshoreman,” who he claimed was the “type of man [who] is not interested in academic discussion nor in recondite theorizing.” For these workers, Carey argued, their principal concerns were practical: “[H]e is the father of a family and a hard working manual laborer. He wants to know how to better conditions for himself, as a worker and for his family.” In 1947, Carey spoke on behalf of many of his fellow labor priests when he argued that “leadership of labor must come from workingmen themselves. Priests are not and cannot be leaders of workers, nor politicians nor employers. The only real leaders of workers must themselves be workers. Leaders are not born; they are educated, trained.” This original principle of Catholic worker education stood at odds with the trend toward cultivating a more elite class of Catholic labor leaders. Ultimately, the internal contradictions of the unions’ relative success and the Catholic approach to labor education played an ironic role in the decline of the Catholic labor school network. BUt they offer instructive lessons for how to build a future grassroots worker school movement that can achieve lasting success in the workplace and in politics. The labor schools may have also fallen victim to the rising consumer culture of the mid-twentieth century. Ironically, it was a consumerism fueled by a reinvigorated labor movement, which commanded for its workers robust contracts, living wages, and access to goods that had previously been luxuries affordable only to the wealthy. Philip Carey saw the consumer revolution and decline of private-sector unions continuing into the Reagan era, remarking in 1983 that “General apathy rules” among workers and that “there has been a drifting off to the far suburbs” — perhaps an example of the twin phenomena of white flight and deindustrialization. The Hartford DLI undertook a fascinating series of surveys beginning in its 1954-55 school year, asking both worker and management representatives to share their thoughts on wage levels, union locals, and the growing number of women in the postwar workforce. Workers sometimes saw the Catholic Church as primarily a foe of communism rather than as a defender of workplace justice, and others felt that because wages had generally risen, there was no longer a need to attend labor schools. Priests and male workers’ intolerance for women entering the workforce also signaled their inability to recognize the growing power of what historian Dorothy Sue Cobble calls “labor feminism.” Many male students blamed women for a host of social ills. Priests’ and students’ comments in surveys revealed profound fears that women’s out-of-house labor would destroy families and men’s masculinity, totally discounting the women students who argued that their work was needed and beneficial. For the priests and male students, it seems clear that “worker” and “man” were interchangeable, and they could not comprehend or tolerate a perceived disruption of their masculine conceptions of labor. A final factor in the labor schools’ decline was the concurrent rise of labor education and industrial relations programs in universities — programs that moved labor schooling away from local communities and into academia. A movement that began with a campaign to meet the rank-and-file workers where they lived and worked had shifted toward professionalized programs that catered to the future leaders of the labor movement and to management representatives. Robert D. McGrath, director of the Hartford chapter of the DLI, argued in 1953 that there was no way for small, local, independent labor schools to compete with their higher education counterparts: “Other professional groups have taken up the program — University of Connecticut, Yale, University of Bridgeport, University of Fairfield. These groups have finances and technical help necessary to carry out a much more organized program than we could attempt.” A combination of university-organized industrial relations programs and insidious attempts by management to co-opt labor education had devastating effects on the local labor schools that were most responsive to the needs of the communities in which they operated. The DLI ended its operations by the late 1960s, and the Xavier Institute, one of the movement’s final survivors, shut its doors in 1988. Overcoming the pitfalls to which the Catholic labor schools succumbed would be critical to a new worker education movement. Breaking down the masculinist conceptions of work that divided labor school students in the 1950s is a requirement. Also necessary is demonstrating to workers that while capital may have “built the capacity, technologically and organizationally, to create a far better world” — one of the ironic factors behind declining student attendance at labor schools — the need for organizing, solidarity-building and maintenance, and worker education have not disappeared. Finally, it is essential to rethink the wisdom of placing organized labor education solely in the hands of neoliberal universities, which have undergone massive “corporatization and casualization” over the past several decades. Why should we expect institutions that work to stifle union organization, to depress wages, and to adjunctify their labor forces to effectively combat the most deeply entrenched forms of workplace injustice and exploitation? A rebirth of grassroots labor schools could signal a powerful return to workplace democracy in action. With democratic socialism in the spotlight once again, it is imperative to transform the philosophy’s foundational principle — “deepening democracy where it exists and introducing democracy where it is absent” — into something more than political campaigns. A new movement of worker education in the mold of a previous period’s community labor schools would be a strong demonstration of this expansive theory of democracy as reality.